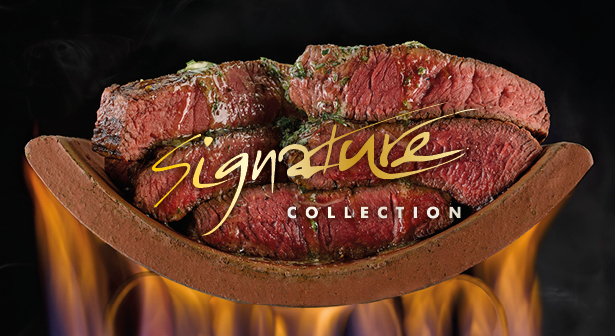 In a spectacular elevated setting on the sixth floor of the Resort Hotel, Steak on Six, one of our two Signature restaurants, offers contemporary dining with a relaxed rustic flavour. 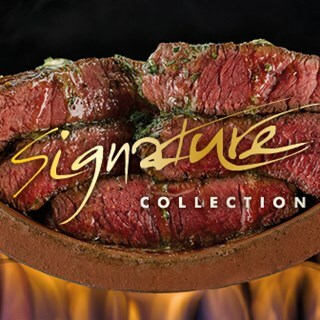 Alongside signature cuts of the finest steaks from around the British Isles, diners can also take their pick from an array of other fine meats and fresh fish, all grilled to perfection. This unique setting is flooded with light from a glass-walled terrace with spectacular views over Coldra Woods. The breathtaking combination of stunning surroundings and exciting, creative culinary concept makes this dining destination a popular choice. Dining at Steak on Six is a good excuse to dress up, although there are no stuffy rules. You’ll feel equally at home in smart casual attire or something a little more formal (please no shorts, vests, flip flops, torn jeans, trainers (white or coloured), football or rugby shirts). Formal footwear is required. Steak On Six welcomes diners from 16 years of age. Delia our Waitress was exceptional and a credit to the restaurant. My wife & I absolutely loved our meals & experience at the Steak on Six restaurant, my only little winge would be you cannot get a pint of draught beer, lager, or cider , which for me personally would be better. We had a wonderful evening, the food was delicious and cooked to perfection. All the staff were lovely but our waiter Victor was so friendly and very attentive. Thank you! Lovely restaurant and a pleasure to visit. Service from the friendly staff was excellent. They were very knowledgeable and explained certain menu choices appropriately. Food was great and very well presented. We both had a dessert and both of us were underwhelmed by them (nice but not wow), after enjoying such brilliant starters and mains. Atmosphere and ambience was great however was slightly spoiled by another table close by to us who were quite loud and rude, but nothing the staff could have really done about this in fairness. Food and service was outstanding, but I felt that it was very loud. I would’ve preferred a quieter setting, but I appreciate there’s not a lot that could be done about this without soft furnishings to absorb the sound. Our waiter was awesome! And attended our every need. The food was absolutely divine!!! I’d definitely come back again. Poor service. Food was overpriced and unfortunately didn’t live up to expectations. Daniela front of house was excellent. Staff were absolutely fantastic and the food was to die for. Thank you all. Our best dining experience to date at the Celtic Manor. The service, food and atmosphere was outstanding. Thank you to all the staff at the Steak on Six for making it memorable. An extra thank you to our waiter Vicktor who couldn't do enough for us. We're looking forward to our next visit. The food was bland and the steak was definitely not worth it for the money. The drinks were nice and the service was lovely but food wasn’t great, very disappointed. Lovely restraunt, service is as good as it gets. The food was outstanding and the service was very good from all the staff. A thoroughly enjoyable experience and one to be repeated! The dining experience as always was first class with an exciting menu to suit all tastes. All staff were very attentive without being intrusive. We dined as a party of four which included my elderly parents and our expectations were exceeded as usual. Special mention to the Maitre D who ensured the evening ran to perfection. The food at this restaurant is of the highest quality. Faultless. Triple cooked chips would be better to serve with steak rather than the potatoes & onion. Delia was a lovely waitress, the whole experience made us feel very special. We would definitely come back soon! A lovely evening and a great meal. Fantastic service. Unfortunately very noisy. Excellent service from all staff especially Nia. Food could have been a bit hotter, temp wise, but the steak was cooked to perfection and just the way we like it. This was a Christmas present but we did notice the prices were very high. Atmosphere not as good as Epicure was. The service was first class, I travel the world for my job and stay in a lot of 5 star hotels and I would say the service we received was up there with the best. All staff were great but I would like to give a special mention to the bar host, I think his name was murat, he was so accommodating, friendly and works so hard. Fantastic Experience, disappointed some other guest do not follow the dress code. A little disappointing. As it was "Mother's Day " Lunch, there should have been a Complimerntary Welcome Drink ! There should have been a Complimentary Present for the Lady in the Party. £48.00 was too expensive for an ordinary Sunday Lunch. Jorge was our server. He was incredibly nice and very friendly, approachable, entertaining and knowledgeable about everything on the menus. Jorge made the evening and would love to Come back. An amazing experience, beautiful food, would highly recommend to anyone. Thank you.